A medium sized century plant grows to 3 to 4 feet tall by 4 to 6 feet wide with a bold greenish cream central stripe and blue green margins. As with the species there are recurved spines on the margins and a long terminal spine. Yellow-green flowers attract hummingbirds, however the Century Plant doesn't bloom until it is a decade or so old (not a century!) and the plant dies after flowering. Plant in full sun. Irrigate occasionally to not at all. Cold hardy to 15 degrees F. This is a large dramatic plant but care must be exercised when choosing to plant; Give it plenty of room and situate it away from traffic. Good on a hillside. This is a very pretty Agave. Use extreme care when working around or trimming any Agave. Not only are the spines wicked and cause a painful swelling if one is poked, but the sap of many species is caustic. Many a person has regretted using a chainsaw, which throws the juices back at the user, to trim an agave. Frost Tolerance: Hardy to 20°F (-7°C); Minimum Avg. Temperature: 50°F (10°C);Heat Tolerance: Excellent;Sun Exposure: Full sun to part sun; Origin: USA (Arizona, New Mexico), Mexico (Chihuahua, Durango), at 4000 to 9000 feet elevation (1200-2700 m); Growth Habits: Perennial succulent. 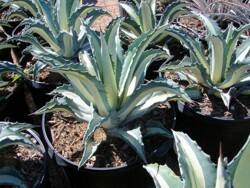 Compact xlustering rosettes, slowly growing to 3 feet in diameter (90 cm), 2 feet tall (60 cm) depending on subspecies; Watering Needs: Infrequent water, needs good drainage Propagation: Suckers (called pups), seeds; The Parry's agave look like a giant artichoke, it is well suited for containers. It tolerates poor soil and drought, but requires excellent drainage. It is sensitive to attacks by the agave weevil; Blooming Habits: Blooms only when the plant is 20 years old or more. 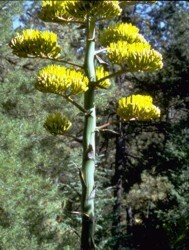 The flower stalk is up to 15 feet tall (4.5 m) with small orange to yellow flowers. The plant then dies leaving suckers that grow into replacement plants. Frost Tolerance: Hardy to 12°F ( -11°C); Minimum Avg. Temperature: 50°F (10°C); Heat Tolerance: Excellent; Sun Exposure: Full sun; A thick-leafed evergreen succulent which dies after blooming. It has pointed leaves which form a basal rosette. It has a slow growth rate. It becomes very large. Century Plant becomes a large agave over 7 feet tall. It spreads to about 8 to 12 feet. 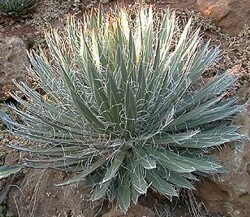 It has long gray glaucus leaves that have recurved spines on the margins and a long terminal spine. It's yellow-green flowers attract hummingbirds, however the Century Plant doesn't bloom until it is about 10 years or so old. It does not take 100 years to bloom! The flowering plant dies shortly after flowering. Plant in full sun. Irrigate occasionally. Not too often! This is a large plant but care must be exercised when choosing to plant; give it plenty of room and keep it away from traffic. The spines are dangerous. Some people think this is the Agave grown for tequila. Technically, tequila is a type of mezcal, however all mezcals are not tequila. To be a true tequila, it must be derived from Agave tequilana Weber azul, or more commonly known as the Webers Blue variety of Agave tequilana.The tequila also must be produced in the Mexican state of Jalisco, in the town of Tequila. We have been to Tequila and you can smell the fermenting for several miles away. Mezcal is made from one of 5 or 6 species of Agave. 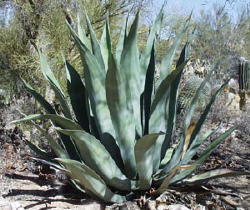 Agave americana, is one used for mescal, not tequila. 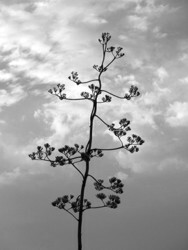 Often confused with Agave americana but, greener, more upright, and narrow; than Agave americana. 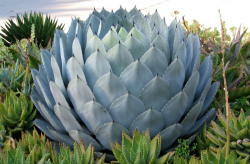 Origin: USA (Texas), Mexico (San Luis Potosi, Tamaulipas); Growth Habits: Succulent rosette, up to 5 feet tall (1.5 m), 6 to 10 feet wide (1.8-3 m); fine marginal teeth; Watering Needs: Little water; Propagation: pups; Sensitive to the agave weevils. Botanical: Manfreda maculosa "Silver Leopard"
The Manfreda maculosa is a plant of the Agave family, notable for its fleshy green leaves covered with purple spots. It is endemic to southern Texas and northeastern Mexico. The plant is acauline (without a stem) and the leaves often lay flat on the ground. In a drought, the leaves will wither and disappear, leaving little or nothing visible above ground. Sufficient precipitation yields an inflorescence 60 cm (24 in) tall in the period April-September. The new flower stalks (inflorescences) are fed on by small mammals, which can end the flowering effort for that season. This rosette forming plant grows to 4 to 6 feet wide and has thick, fleshy gray green leaves densely covered with brown-purple spots. 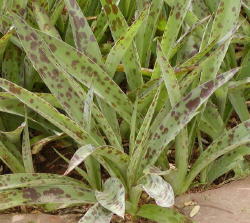 These spots are so thick toward the tip of the leaves that the entire surface is a brown-purple color. 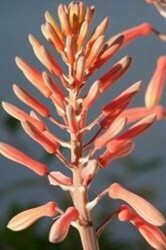 The thick reddish flower stalk rises from the middle of the plant much in the manner of an Agave. Plants remain solitary until flowering at which time several new plants will emerge from below the older rosette. Plant in full sun to light shade and water infrequently to regularly. Has been reported to be hardy to 9° F by Tony Avent in North Carolina. This 2004 Yucca Do Nursery introduction is thought to be either an intergeneric hybrid between Manfreda variegata and Agave celsii [A. mitis] or a tetraploid mutation of Manfreda variegata. It was from seed collected by Carl Schoenfeld while on a plant exploration trip into Mexico. The seed came off of a plant of Manfreda variegata at a location where there was also Agave ceslsii. Yucca Do Nursery has since dubbed this plant a "Mangave". In the recent treatment in "Illustrated Handbook of Succulent Plants; Moncotyledons" edited by Urs Eggli (2001) Joachim Thiede, the author on the Agavaceae, combined Polianthes (Tuberose) and Manfreda into Agave, thus making the Mangave actually an interspecific Agave hybrid - for now we will leave it as x Mangave. The description above is based on our research and observations of this plant growing in our nursery and in our own and other Santa Barbara gardens. We would appreciate hearing from anyone who has additional information or disagrees with what we have written. Aloe 'Blue Elf' - A tight clumping aloe that grows to 18 inches tall by 2 feet wide with narrow upright gray-blue leaves that contrast well with spikes of orange flowers that appear from early winter to early spring (January-April) and attract hummingbirds. Plant in full sun and irrigate only occasionally. Hardy to to 20° F. Useful in containers or in mass plantings. This great long blooming aloe hybrid may have been one of Edward C. Hummel's hybrids and is thought by some to have Aloe humilis as one parent but is not the same as the A. humilis hybrid called 'Ed Hummel' which is smaller and has spines on the upper and lower leaf faces - has also been marketed as "California Aloe". A mature plant rarely exceeds the height of about 16 inches, but can clump from the base to eventually be as wide as 3 1/2 feet. Clumps explode with many spikes of coral-red flowers in late winter and continuously through spring. When the show is all over, the slender leafed foliage remains wonderfully blue throughout the rest of the year. It is very pool friendly. Height: Height to about 3 - 3 feet. Spreading to about 4 feet. Flowers: Yellow drooping flowers grow in a long raceme at the top of the flower stalk. 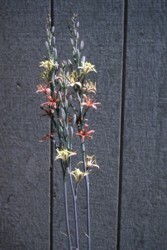 On an inflorescence that is branched into 3 to 8 racemes, the racemes sre 8 inches to 16 inches in length. Flowers are 1 inch - 1 1/4 inch in length, tubular in shape and slightly upturned at the mouth. Blooming Time: January - July. Leaves: Smooth gray - green in color, narrow and oblong in shape, the leaf - margins have small, sharp teeth that are red - brown in color. Stems: Stemless, densely leaved rosette. Fruit: The fruit is a triangular capsule containing numerous seeds. Elevation: 0 - 4,800 Feet. Habitat: Sandy or gravelly, well-drained soil. Full Sun. Best with some shade. A Xeriscape Landscape plant. Native to Northern Africa, the Canary Islands and the Cape Verde Islands.. 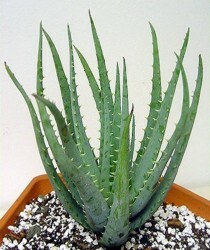 The nearly 420 species of Aloe are confined mainly to Africa with Aloe ferox among the tallest. 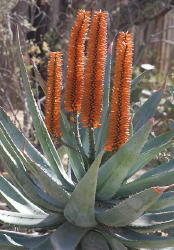 Aloe ferox occurs naturally in a broad belt along the southern and eastern coast of South Africa. 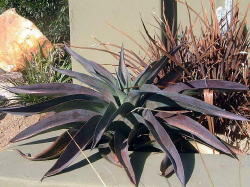 Aloe ferox is a robust, single stemmed, plant usually 2m (80”) high, but up to 5m (200”) tall in older specimens. They have broad, fleshy leaves that are dull green to greyish green with brown spines along the edges. 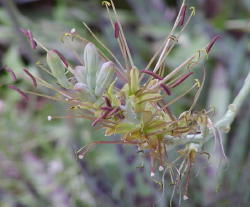 The dry leaves are persistent on the lower portion of the stem. 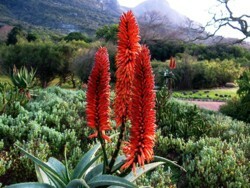 Bright red or orange flowers appear from May to August and are arranged in erect, candleshaped clusters (Van Wyk 2003). Pollination is by bees and nectar seeking birds and propagates with ease. New plants reach maturity (to flower and set seed) within four to six years. Under favourable conditions plants may become in excess of 50 years old. 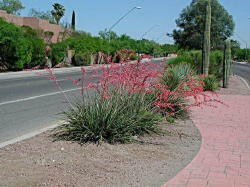 A clump-forming succulent, red yucca has arching, leathery, linear foliage rising to between 2 and 3 feet tall. Dark olive-green leaves with no thorns or spines are sparsely covered with fibrous strands along the margins. Deep coral pink flowers with golden yellow throats crowd the length of the stalks that reach three feet or more. Foliage has a reddish bronze hue during winter's chill for year-round interest. Noteworthy characteristics: Simple form, sturdy constitution, and long bloom time. Closely related to yucca. Very heat tolerant, yet cold hardy to Zone 5. Care: Grow in poor to moderately fertile, sharply drained soil in full sun. Avoid excessive moisture in winter. Propagation: Pot up offsets in spring. Problems: Scale insects. Aphids during bloom time.